On September 24, Police Chief Chris Sutter was formally introduced to lead the Tulalip Police Department. After longtime Police Chief Carlos Echevarria resigned back on December 4, 2017, the Board of Directors named Commander Sherman Pruitt interim chief. Since that time, the process to fill the post permanently was ongoing, but it has finally come to a close. On September 24, Police Chief Chris Sutter was formally introduced to lead the Tulalip Police Department. 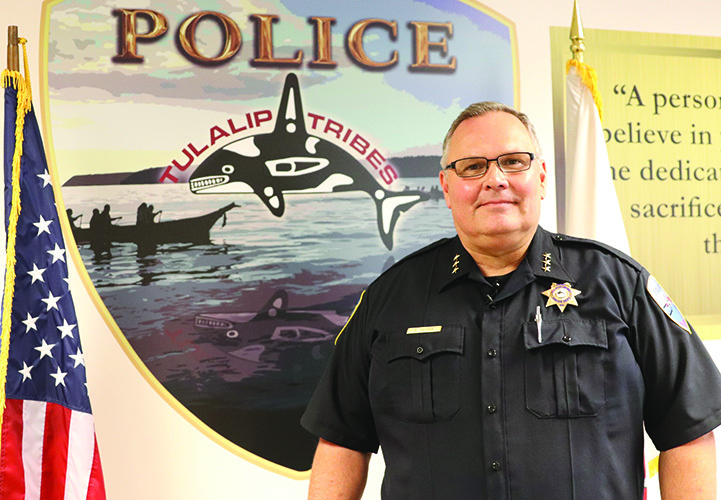 “The Tulalip Tribes is pleased to announce that Chris Sutter is joining the Tulalip Police Department as our new Chief of Police. Following a comprehensive search for the right candidate, Chief Sutter’s experience and background quickly rose to the top of our candidate pool. We welcome Chief Sutter and his family to our community,” stated Chairwoman Marie Zackuse. Chief Sutter met with syəcəb staff for an interview detailing his past experience as a law enforcement officer and what his immediate vision is for leading the tribal police department. What follows is an unedited transcript of that interview. Q: The first thing many are wondering is what is your law enforcement background? A: I come to Tulalip with 32-years of law enforcement experience. The last 26 years has been with the City of Vancouver in southwest Washington, where I served as assistant chief of police the past 10 years. Q: Please describe your experience working with Native communities? A: My experience working with Native communities is more on the personal family side. I’m married to an enrolled tribal member of the Navajo nation. For 38-years, we’ve enjoyed a very happy family and close relations with our tribal family. Also, in my previous role as assistant chief, I held a monthly diversity advisory meeting with representatives of the diverse Vancouver community which included Native American representation. Q: Uprooting from Vancouver, will you be living in Tulalip now? A: Yes, I found a rental home here in the community and am very much looking forward to being part of the community. As the school year completes, my wife and daughter will joining me here in Tulalip. Q: What are some of the goals you’d like to achieve over the next couple years with the Tulalip Police Department? A: I have many goals and a high-level vision for moving the department forward. Number one is to make sure Tulalip is a safe and secure place for families, children and the elders. We’re going to start by eradicating the drug problem in the neighborhoods. We’ll also be working on community outreach to make sure people know that their police department is here to serve them. In addition, we’ll be looking into ways we can best serve the fish and wildlife branch of the department to ensure tribal sovereignty and treaty rights are always respected and upheld. Q: Our last few police chiefs have tried to tackle the opioid epidemic. What are some ideas you bring to the table on this issue? A: Number one is we can’t allow people to be selling drugs to our tribal members and anyone else in the community. We have to crack down on those who are profiting on this horrible trade that causes such devastating impacts to individuals and families. We’ll be implementing a very robust narcotics taskforce that’s going to take down the dealers. In my opinion, the first step is to go after those people who are bringing the drugs into our community. Q: How do you see the Tulalip Police Department engaging with the community going forward? A: Community engagement is as simple as directing all the officers to make sure they are taking the time to get out of their cars in order to walk and talk with people we serve. Making face-to-face, personal connections is the first step to building a better relationship. We are also going to find opportunities to sit with tribal elders and receive their guidance and wisdom, ensuring we have good open lines of communication. Additional outreach will involve our youth. I strongly believe the youth are our future and the more we outreach, mentor, and guide them to make good life choices the better the outcomes. Q: Describe your experience working with tribal police? A: During my time in Vancouver, I acquired experience working with the Cowlitz Reservation and their newly created police department under former Tulalip police chief Goss. Through that connection we built a quality working relationship and provided assistance to each other when needed. Q: What’s your message to the Tulalip community? A: I feel blessed to be here to serve the people. My message is we are here to serve you. We want to make sure you always feel welcome and comfortable to make contact with our dedicated staff of officers and civilians. My commitment to the community is we are going to do our very best to make your neighborhoods secure and to make Tulalip Reservation a place residents are very proud to live. This entry was posted in News, Top Story, Tulalip News and tagged Chris Sutter, Tulalip, Tulalip Police Chief, Tulalip Police Department by Kim Kalliber. Bookmark the permalink.